Amber, one of my favorite adornments, is actually not a stone but a sticky, fossilized tree resin. Amber often contains animal and plant material known as inclusions and comes in a wide a range of colors from translucent from the Dominican Republic to brown, orange and yellow from the Baltics to deep, black from India. It is considered the first substance to be used as a form of adornment and amber beads have been found in northern European gravesites as old as 8000 BC. 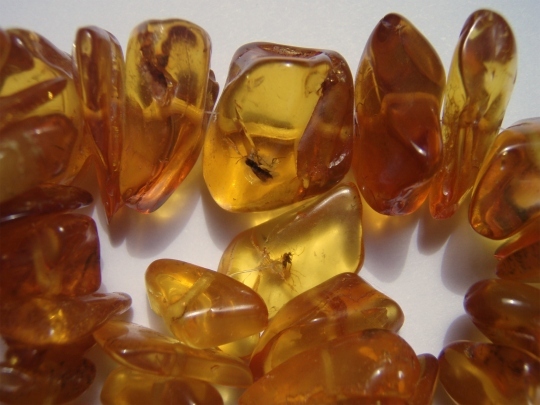 The formation of amber is a natural phenomenon that takes millions of years.Since it originates as a soft, tree resin, amber often contains animal and plant material as inclusions. The first amber fossils from the African continent- the northwestern plateau in Ethiopia- were discovered two years ago, revealing a snapshot of life 95 million years ago and giving clues to the evolution of animals and plants. Because amber is warm to the touch, is associated with longevity and often contains life,it has been considered sacred by many cultures. It is contains the element of fire, and is governed by the sun. Through the years, humans have worn amber for luck, healing, strength, protection, love and beauty. In Greek mythology, amber was thought to be solidified teardrops or the essence of the sun’s rays. Ancient European painters used the color amber to denote the divine and faces of gods and goddesses, heroes and saints were all painted in amber. Africans believed amber has healing powers because of its warm colors that capture the sunshine with brightness and robustness. African amber or copal, is not as old the true amber. Copal is semi-fossilized or younger. It is found mainly in Zanzibar Island, Morocco, Kenya, and Mali. However, just as it reflects the beauty of true amber, copal also carries its mysteries and power of true amber. Infuse your aura with the enigmatic mysteries of amber. 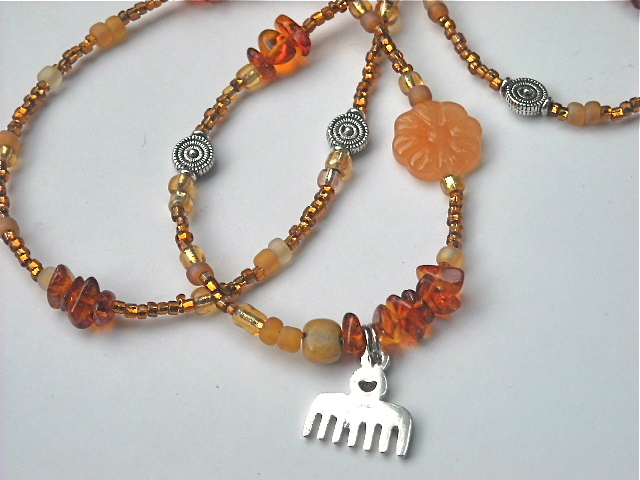 Check out these waistbeads in amber and other gemstones from Wrap and Soul.